The Summer Undress Uniform is worn as the standard uniform of the day during the warmer months of the year. The individual items that make up the Summer Undress Uniform for regular members, and for associate members is illustrated below. 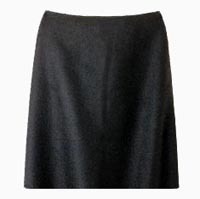 Specific regulations regarding this uniform are provided following these illustrations. The regulations regarding the Summer Undress Uniform for both regular and associate male members is provided below. 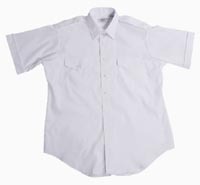 Short Sleeve Aviators Shirt: The short sleeve Undress Uniform shirt will be an aviator style shirt, with two button down breast pockets and shoulder epaulets. It will have a military crease running top to bottom, centered on each pocket and three creases on the back. The shirt shall be worn with an open collar. 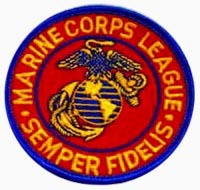 Flag and Member Patches: The Marine Corps League Shoulder Patch is worn by regular members on the left shoulder of the long sleeve aviator shirt, centered on the crease, 1½-inches below the shoulder seam. 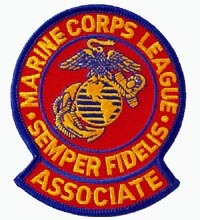 Associate members are not permitted to wear this patch, and should wear the distinctive Associate Member Patch, placed in the same manner as that of the patch of regular members. The Field Forward Flag patch will be worn by both regular and associate members on the right shoulder, centered on the crease, 1½-inches below the shoulder seam. Collar Devices: Regular members shall wear a pair of collar devices consisting of the Marine Corps emblem on a red-colored background, surrounded by a gold-colored embellishment. These devices are commonly referred to as "Sunburst Insignias" and shall be worn on each collar of the shirt, centered ½ of an inch from both edges of the collar, with the anchors pointed inboard and the wings of the eagles parallel to the deck. Associate members shall not wear these "Sunburst Insignias" but shall instead wear the distinctive collar devices designed for associate members. These devices consist of a pair of rectangular gold-colored devices that contain the lettering "MCL." These devices are to be worn on each collar of the shirt, centered ½ of an inch from both edges of the collar with the lettering properly oriented and parallel to the deck. 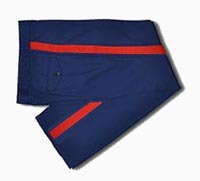 Trousers and Belt: The blue trousers with the red non-commissioned officer's stripe are worn with the Undress Uniform by regular members, along with the Marine Corps khaki web belt and brass buckle. It should be noted that the scarlet stripe on the dress blue trousers are to be that worn by Marine non-commissioned officers which is 1.12-inches in width, not the wider stripes worn by active duty Marine officers. 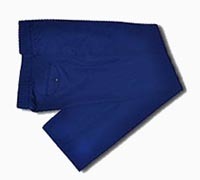 Associate members may also wear blue trousers with the Marine Corps web belt and brass buckle, however their trousers will be devoid of the scarlet non-commissioned officers stripe. As an option, black trousers with a black belt and square gold buckle with the Marine Corps Emblem may be worn with the Undress Uniform in lieu of the blue trousers and web belt. 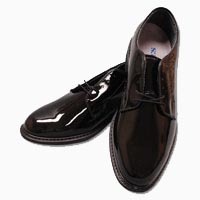 When wearing the black trousers, the belt can be either be a 1½-inch or 1¼-inch wide black leather belt. The wide leather belt is worn with the large square buckle, while the narrower belt is worn with the rectangular buckle. Both buckles are gold in color and have the Marine Corps emblem on them. 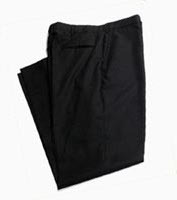 The black trousers may be purchased at any clothing store. 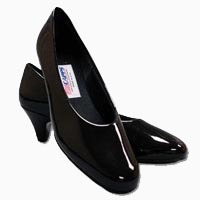 The length of both the blue and black trousers should be such that the bottom cuff of the trousers just touches the top of the heel sole of the shoes. Other: A name tag may be worn above the right breast pocket of the shirt, centered and one-eighth of an inch above the top of the flap. Ribbons are also authorized for wear and will be placed centered and one-eighth of an inch above the left breast pocket flap. The ribbons are to be worn in rows not exceeding four ribbons per row. If the top row has fewer ribbons than the lower rows, they are to be centered on the lower rows. In all cases, the ribbons worn must either be those of official military awards or those of Marine Corps League awards since commingling of these two types is never authorized. The regulations regarding the Summer Undress Uniform for both regular and associate female members is provided below.